Looking over my bookshelves, I had a bit of a revelation: there are very few books that really use robots as characters in them. Taking a look, I only see Isaac Asimov's I, Robot and several additional collections of short stories, a collection of Ray Bradbury stories that contains 'There Will Come Soft Rains', a couple of Iain M. Bank's Culture novels, Arthur C. Clarke's novel 2001: A Space Odyssey, Ekaterina Sedia's Alchemy of Stone and maybe a couple of others that I passed over. An additional trio of books: Ambassadors from Earth, Edison's Eve and Wired For War all represent a significant figure when it comes to real - life robotic systems and theory. However, looking over the movies that I have on my shelves, robotic characters readily come to mind: C-3P0 and R2-D2 from Star Wars, The Terminator from that franchise, Robbie from Forbidden Planet, the replicants from Blade Runner, Ash from Alien, Andrew from Bicentennial Man, Sonny from I, Robot, and so forth. I have to wonder about this: there is a large gap in recognizable characters between the two mediums, film and literature. Film seems to contain far more in the way of robots, androids and mechs that come to mind, while I have a difficult time remembering the names of some of the characters from some of my absolute favorite science fiction books. The first element in which film readily becomes the better medium is its visual nature, allowing for elaborate costumes, props and CGI'ed components of metal and plastics that make up what audiences really think about with robotic characters. Some of the most dramatic imagery from science fiction cinema includes robots: C-3P0 and R2 in the hallway of the Tanative IV, The Terminator coming out of the flames, Ash getting his head bashed in, and so forth. Simply put, robotics are more visual, allow for some differences between living characters and their mechanical servants. Indeed, it should come as no surprise that early views towards robotics weren't necessarily looked at in any sort of favorable light: throughout history, a constant struggle between leaders and those being led has come about, and one lesson that a history teacher (Mr. David Munford, thank you), imparted was the destruction of clocks and machines during one early worker uprising. The use of factories in particular lends itself well to machinery and associated dystopia images and themes. Henry Ford put to good use the assembly line, which relegated skilled labor to fastening single bolts day in and day out. It is particularly ironic that those human workers were in turn replaced by robots who do the same roles for them. 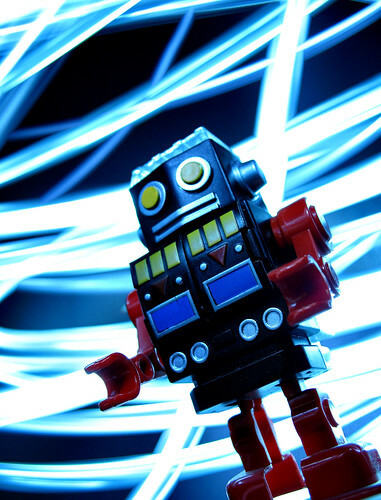 In literature, then, the use of robotics goes far beyond characters, but is typically used as part of a larger theme that a novel is trying to push across to the reader. The Three Laws of Robotics that are central to Isaac Asimov's robot books are particularly conscious of this fact, and represents some level of paranoia on the part of the human race that at some points, robots will eventually take over humanity because of their inherent strengths over human flesh: stronger, faster, smarter, etc. This makes Asimov’s novels somewhat different from the earlier books with mechanical imagery linked to dystopia: Asimov’s world shows where a fall of society has not occurred because of the indulgences by humans, but generally only because the robots that we’ve essentially created in our own image are just as screwed up as we are. Dystopia, in this case, may be in Asimov’s futures – we certainly see that in his Foundation stories – but for the time being, he views a world with robotics as one where robotics act as a natural counterpart for humanity, rather than a replacement, although the threat, held in place by his three laws, is still there. In films, however, different elements are brought out: robots are the servants of humanity & associated sentient life in Star Wars, performing vital and specialized tasks while interfacing with their creators. The same goes for the robots in Blade Runner and Wall*E. At other points, they're used for war, such as in Ron Moore's Battlestar Galactica, where they then turn on their human creators for a variety of reasons, or under the control of a vast, superhuman intellect, such as in the Terminator franchise. Here, these elements often, but not always, hearken back to a sort of dystopia, where robotics are part of a larger problem: it represents the failure of the human race to continue with its biological need to reproduce, and demonstrates some basic elements of life itself: Darwinism or survival of the fittest. Those that cannot keep up, will be destroyed, or at least overcome. Within literature, the larger themes of dystopia and robotics are used, with the protagonist generally someone who overcomes the system/society/social norm to relearn what it means to be human, and there is a larger theme of the scientific, mechanical, logical order, represented by robotics, and a more organic, theological, chaos, represented by people. At points, this is represented with some very pointed examples: Ray Bradbury’s ‘There Will Come Soft Rains’, which shows a robotic house living diligently on long after its inhabitants have destroyed themselves. However, the reason that robots themselves seem to be fewer and farther between is because there is an inherent need for this dystopia theme to be present in the film: it represents the weakness of humanity, carries with it religious overtones and two extremely different styles of thinking all wrapped up into a single character, which oftentimes, seems to be difficult to work in or really justify as a regular character in a book that takes just part of the story, especially if they are not the central part of a story. Their existence represents so much in relation to their human counterparts, it would seem almost a waste to have a story with a side character as a robotic entity, rather than fleshing out everything that he/she/it represents. With movies, these themes are there occasionally, but generally, explosions and violence comes first and foremost in the eyes of paying audience members.